At times woodworkers find that a bull nose router bit cuts deeper than they want for their design. The solution is the oval edge router bit, often called a bull-nose router bit that provides a shallower cut. 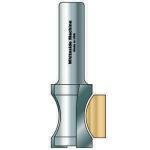 Whiteside router bits are manufactured by the award-winning Whiteside Machine Company factory. Take time to look over the list below to choose the best one for your next project. 1-1/4" 13/16" 1/2" 5/32" 7/8"
1" 1/2" 1/2" 1/8" 1/2"
1-1/4" 1" 1/2" 3/16" 3/4"
1-1/4" 1" 1/2" 3/16" 1"
1-3/4"" 1-1/4" 1/2" 1/4" 1-1/2"